Now here's a time saver, lifesaver, craving satisfier, or whatever you want to call it recipe. I love Pesto. It's one of those things that can really make me happy when I eat it. In my opinion it would make everything taste better. 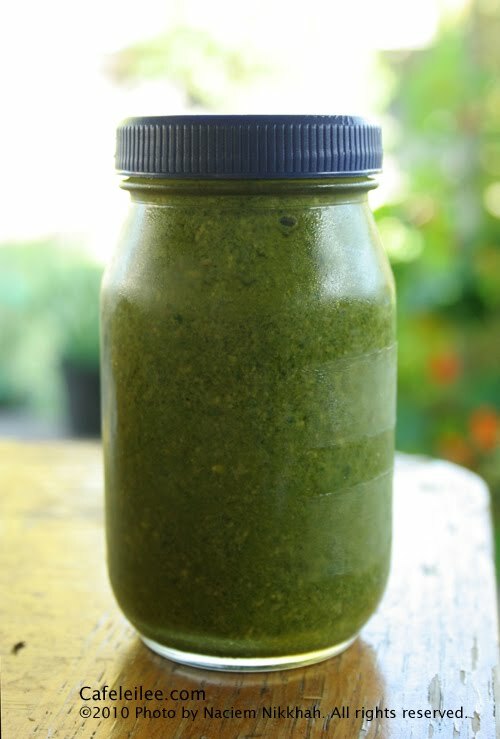 Now you can buy pesto from almost every grocery store, but I prefer making my own. It just tastes more fresh and I can adjust the seasoning to my liking. Honestly it takes no time to make it on your own. I like to make a jar full of it when I have the time and store it in the fridge. 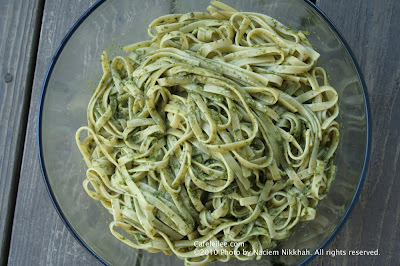 When I'm busy and don't have the time to prepare a whole meal, I just cook some pasta and toss it with some pesto sauce. I use it with many things other than pasta. Cut some potatoes and mix them with pesto then roast them in the oven and you won't believe that potatoes could taste this good. Place the basil leafs in the bowl of a food processor and process for a few seconds until the basil is chopped. Add the cheese, pin nuts, and garlic, and while the processor is running, add the oil in a thin, steady stream until a mostly smooth sauce is formed. Season with enough salt and pepper. Transfer to a clean jar, and cover the top of the pesto with a thin layer of olive oil to prevent it from darkening. It can be kept in the fridge for 3 to 4 weeks. If making pasta, bring a large pot of salted water to a boil. Add 1 1/2 pounds pasta and cook, according to package directions, until al dente. Drain pasta, reserving about half a cup of the cooking liquid. In a large bowl, toss pasta with pesto. Add a little of the reserved cooking liquid if pasta seems to dry. ریحان را داخل هاون یا مخلوط کن ریخته و بکوبید تا ریحان خرد شود. سیر، دانه کاج یا گردو و پنیر را اضافه کنید. وقتی مخلوط یکدست شد، روغن زیتون را کم کم اضافه کنید تا مخلوط نرم شود. نمک و فلفل را به اندازه لازم به پستو اضافه کنید. پستو را میتوان برای ۳ تا ۴ هفته در یخچال نگهداری کرد. برای این کار آنرا در یک شیشه تمیز بریزید و روی آنرا یک لایه نازک روغن زیتون بریزید تا سیاه نشود. برای اینکه پستو را با پاستا بخورید، ۷۵۰ گرم پاستا را در آب جوش بپزید. پاستا که پخته شد، حدود نصف لیوان آب آنرا ذخیره کنید و پاستا را آبکش کنید. سس پستو را اضافه کنید و به اندازه کافی آب پاستا اضافه کنید تا پاستا خشک نباشد.